Ten thousand people took part in the 'battle of wine' festival in Haro, Rioja, throwing 130,000 litres of red wine at each other. The annual Rioja festival – named ‘La Batalla del Vino’ in Spanish – is held on 29 June for St Peter’s Day. It starts with traditions that have been maintained for three centuries, including a procession with the town mayor, and a pilgrimage to the Hermitage of San Felices de Bilibio, the patron saint of Haro – before the battle of wine begins. 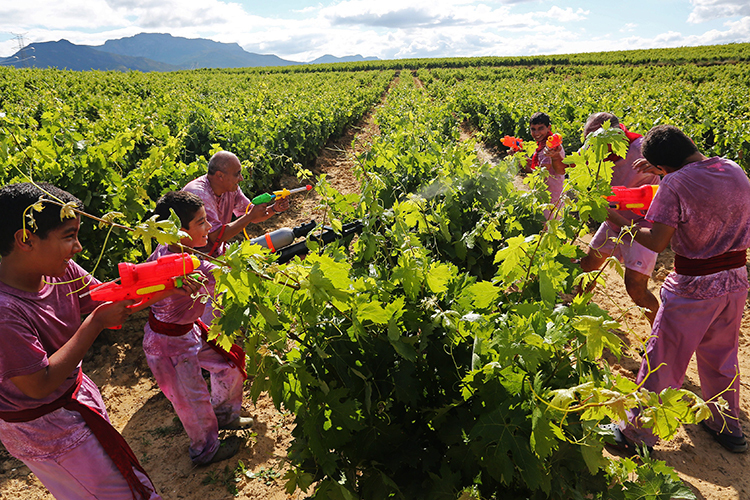 Now enjoyed by tourists and locals alike – although total numbers are down from 2014, according to Spanish news outlet Cadena SER – attendees wear all white clothing and throw wine at each other from buckets and jugs. Some also use water pistols, as shown above. As well as the Rioja wine, revellers enjoy other local delicacies, including chorizo and morcilla sausages. There are various tales for the reason that wine is thrown at the celebrations, which has developed as a tradition over the past century. Some claim it pays homage to a 13th century land dispute between residents of Haro and those of neighbouring Miranda de Ebro, which ended with a wine fight. Others say it developed from the saint’s day feasts becoming increasingly wild over the years and eventually being replaced with the wine battle. Trucks are used to transport the wine up to the Cliffs of Bilibio, and whilst Haro City Council provides 3000 of the litres of wine, the other 127,000 is donated by the participants. See the Youtube video below by Lonely Planet.